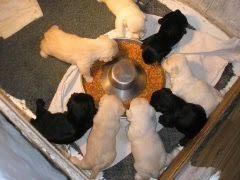 only 1 Black female left! They are ready to go to new homes, they have AKC papers,Microchip, 1st shots & worming. They are eating dry Purina Puppy Chow Healthy Morsels. Taking orders until they are gone...!